Genetic, Genomic or Geomic — it all sounds a bit confusing. Let me see if I can help sort it out for you. Genetics is the study of heredity. Heredity is a biological process whereby parents pass certain genes onto their children or offspring. Genomics is the study of genes and DNA in a person or another living organism. What then is the Geomic Code? The word Geomic is a “portmanteau” or combination of geometry and cosmic, thus forming a new word. This combination was created by Phil Canville Sr., and its definition has evolved over the 50 plus years he worked on it. 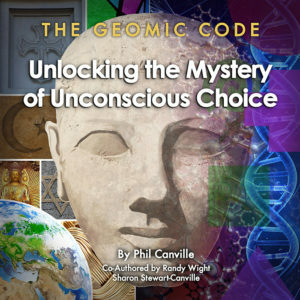 Phil saw this Geomic Code as a sort of genetic code of the soul. He also saw the universe as the place from which everything came, and that was what compelled him to create the word and his work focused on Geomic Code. What could possess someone to work on a project for more than 50 years? Why did Phil think this was so important? What made imperative that the work result in a book available to all? Phil believed that this was information all of us needed to know to effectively relate to others and the world around us. In short, Phil thought the Geomic Code could, if used properly, be a personal road map to better relationships, communication and collaboration. Beginning in the early 1960’s Phil, who ran a watch repair shop in Walnut Creek, CA, and later became a jeweler, was in search of a shortcut in design. He eventually designed a test that he believed would allow him to ascertain what women wanted in their designs. This “test” would become the foundation for what would later be called the Geomic Code Assessment. After finding success with the test, he decided to see if it was gender specific or if this Geomic Test was universal. The answer surprised him. Indeed, he had uncovered a gateway to understanding unconscious choice, and he reasoned, a way of understanding how we interact with the world around us. Phil worked with a woman who would later become his wife, Sharon Stewart. She helped Phil, who had struggled with writing because he was dyslexic. After Sharon painstakingly translated his notes into readable text, Phil began searching for someone to help him transform this text into a book. Fortunately for me, Phil, a fellow toastmaster, allowed me to begin the task of converting Sharon’s translations into a book. Phil, before his passing in late 2013, even got a chance to see and approve the first draft and the cover of the book. I spent many afternoons and evenings asking questions and further clarifying his life’s work, all of which have resulted in the book you see today. I know he is happy that what he viewed as a landmark view into cosmic consciousness is now available to everyone who would like to understand more about how their unconscious choices affect their everyday interactions with the world around them.